It’s tough not to when Metro by T-Mobile’s (NASDAQ: TMUS) wireless service covers 99 percent of people in the U.S. at a fraction of the cost of AT&T and Verizon! 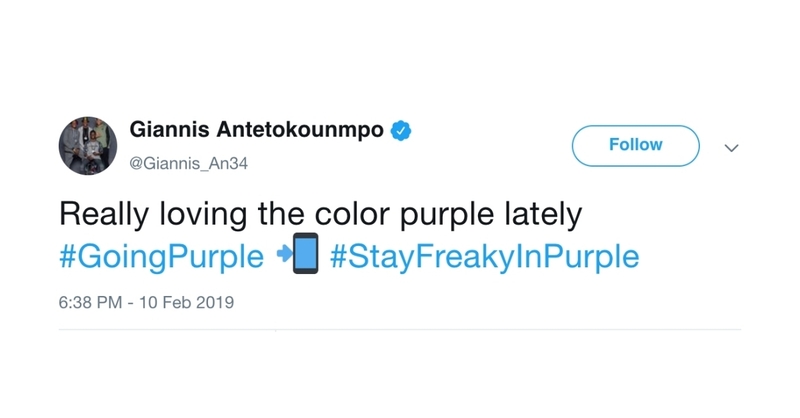 Today that “thinking” has transitioned into action: Giannis is #GoingPurple twitter.com/Giannis_An34/status/1095345478995202055 – picking Metro as his wireless provider and playing the leading man in Metro’s TV ads launching during the TNT doubleheader tonight. Giannis is known for his savvy and flair: eurostepping his way to the hoop, savage chasedown blocksand rim-rattling throwdowns in traffic— so it’s no surprise that he’d team up with Metro, the logical choice for the savviest among us. Why? With Metro, you get four lines of unlimited data, talk and text for just $120 per month – that’s a savings of more than $1,200 a year vs AT&T and Verizon! Follow MetroByTMobile on Twitter for updates on all the ways you can keep up with Giannis. If congested, the fraction of users >35 GB/mo. may notice reduced speeds and Metro customers may notice reduced speeds vs. T-Mobile due to prioritization. Video streams at 480p. Unlimited on handset and on network only. Savings claim based on 4 lines on Metro 4/$120 Unlimited LTE plan vs Verizon Beyond Unlimited and AT&T Unlimited & More Premium without autopay discount including taxes/fees. Features on plans, including video resolution, mobile hotspot, and included entertainment and international services vary. No purchase or payment required to enter sweepstakes. Void where prohibited. Open to legal U.S. residents who are the age of majority in their state of residence or older. Odds of winning depend on the number of eligible entries received. Subject to complete Official Rules available at www.metropcs.com/TeamGiannisRules. Sponsor: T-Mobile US, Inc.
As America’s Un-carrier, T-Mobile US, Inc. (NASDAQ: TMUS) is redefining the way consumers and businesses buy wireless services through leading product and service innovation. Our advanced nationwide 4G LTE network delivers outstanding wireless experiences to 79.7 million customers who are unwilling to compromise on quality and value. Based in Bellevue, Washington, T-Mobile US provides services through its subsidiaries and operates its flagship brands, T-Mobile and Metro by T-Mobile. For more information, please visit www.t-mobile.com.